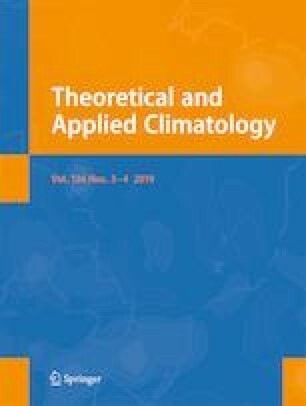 This analysis of the frequency, intensity, and duration of thermal inversions is based on daily minimum (tn) and maximum (tx) temperatures recorded over 3 years at 16 pairs of data loggers located under forest cover in the Jura Mountains of France. Each pair consists of a logger located at the bottom of a depression and another located higher up either nearby (local site) or more than 40 km away (regional site). The daily frequency of inversions is maximum at local sites for tn (50%) and minimum for tx at regional sites (4%). The maximum intensity of the inversions reaches 15.1 °C for tn and 16.2 °C for tx. The average intensity is about 2 °C: 1.5 °C for tx at local sites and 2.4 °C at regional sites. The duration of inversions is generally short: 60% of them last less than a day. Of the inversions that last for more than 1 day, 15% exceed 3 days and the maximum duration observed is 22 days. The relationship between the diurnal amplitude of temperature and the frequency, intensity, and duration of inversions indicates that mesoscale atmospheric conditions directly influence inversions. The online version of this article ( https://doi.org/10.1007/s00704-019-02855-3) contains supplementary material, which is available to authorized users. We thank Météo-France for providing data free-of-charge, the “Parc Naturel Régional du Haut-Jura” and the “Conseil Régional Franche-Comté” which largely financed this study as part of the “Haut-Jura: l’énergie du territoire” LEADER programme, the “Long-term ecological research site Jurassian Arc” (http://zaaj.univ-fcomte.fr/?lang=en) for purchasing some of the loggers and the local mayors and private landowners who allowed us to set up the loggers in forest plots belonging to them.